There are five weeks left in the challenge to drink one cup of bone broth every day. How are you doing? This is the soup we’re enjoying this week. My little boy thinks beans are food of the gods. The longer you cook this soup, the creamier it becomes. It’s a good soup. I recommend you sprout your navy beans for this soup. Sprouting drastically reduces the stomach discomfort that so many people associate with beans. It turns the bean into a vegetable and your body processes it differently. I never hear any complaints out of my children when the beans are sprouted before cooking, but they do complain of some discomfort and gas if we soak and cook. This recipe is from the Menu Mailer. In a soup pot, heat the fat over medium-high heat. Add the onion and cook for 5 minutes or until tender. Add the bacon if using and cook until done, stirring often. Add the ham if using, garlic, stock, carrots and beans. 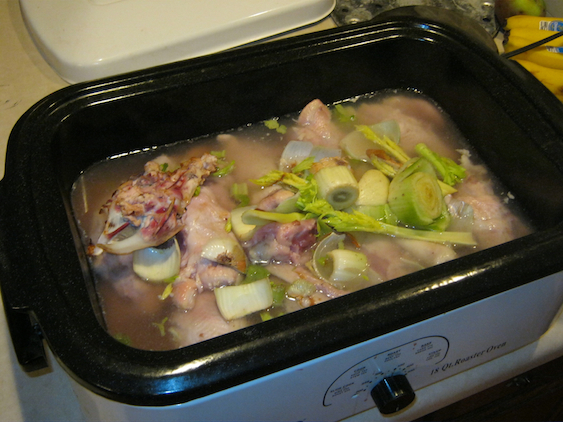 Add additional stock or water to cover, if needed Bring to a boil, reduce heat, cover and simmer for two hours. Add the spices and simmer until you need to serve the soup- the longer you simmer it, the more the flavors blend and the creamier the soup becomes. Keep an eye on the liquid level and add more stock or water if needed. Remove bay leaf before serving. This post has been shared as part of the Real Food Wednesday Carnival over at Kelly the Kitchen Cops blog.